The brightly banded western coral snake, a relative of the Indian cobra, injects a venom twice as powerful as the rattlesnake. But because of its size, anatomy and habits, there are no known deaths in the desert southwest attributed to its bite. Sonoran Desert of Arizona and northern Mexico, to the southwest corner of New Mexico below 5,800 feet. Encountered in a number of habitats, but is most frequent in rocky, upland desert regions where saguaro cactus is prevalent. The small western coral snake has a correspondingly small head. Adults grow only 13 to 22 inches in length with a girth about the size of a pencil. 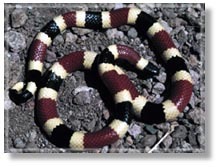 The coral snake is remarkable for its wide red and black bands and narrow yellow and white rings completely encircling its body. Worldwide, there are about 65 species of coral snakes, all members of the of the cobra family (Elapidae). Micrurus is the large genus of coral snakes in the Americas. Micruroides is the genus to which U.S. (and northern Mexico) coral snakes belong and is a genus unique to the northern forms. The western coral is nocturnal in its habits and is most likely to be out and about after summer rains, when few people are present. Coral snakes are very secretive, spending most of their lives under rocks or buried in the soil. Its bright coloration serves as a warning to predators, but if provoked, it will bury its head in the coils of its body and raise its tail to expose the underside. The coral snake then everts the lining of its cloaca, making a popping sound to startle enemies. The neurotoxic effects of its potent venom cause rapid paralysis and respiratory failure among its favorite cold-blooded prey, snakes and lizards. It prefers tiny blind snakes throughout its range, but will eat shovel-nosed snakes, black-headed snakes and whiptail lizards. Females lay 2 or 3 eggs in the late summer which take about 10 weeks of incubation before hatching. Upon emerging, the young are 7 to 8 inches long.